Our product information guide is here to help you choose the right products for your fairy garden. 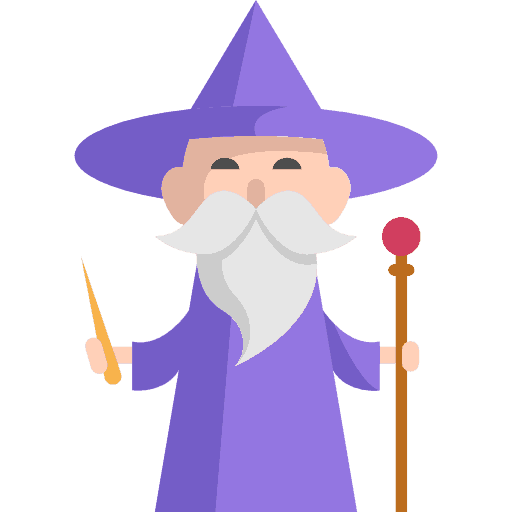 If you have a question about design, size, features or usage, you are likely to find it here! What are fairy garden products made of? 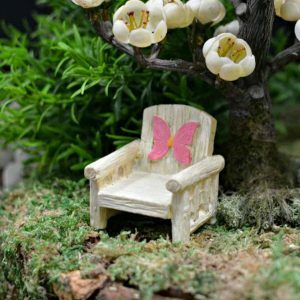 Are fairy garden products designed for outdoor use? 1. What are fairy garden products made of? Polystone is a compound made up largely of polyurethane resin mixed with powdered stone additives to give a stone-like finish. Polystone has a stone like feel, but is much easier to work with during the manufacturing process. Polystone has a significant weight and porcelain like feel to the touch. 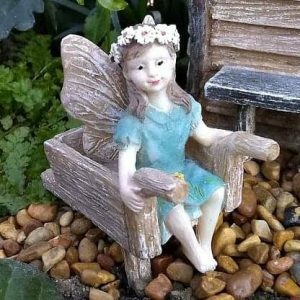 It’s incredible ability to capture the most minute detail makes it ideal for manufacturing of fairy garden ornaments. 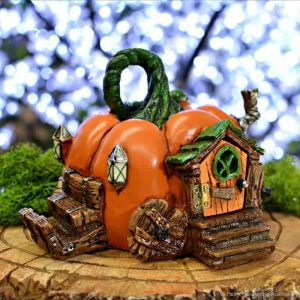 Polystone does not have to be fired like porcelain, which gives it much more flexibility when it comes to painting and allows our manufacturers to create the tiny detail you see on our fairy homes and accessories. Synthetic Resin is also commonly used. Synthetic resins are materials with a property that is similar to natural plant resins. 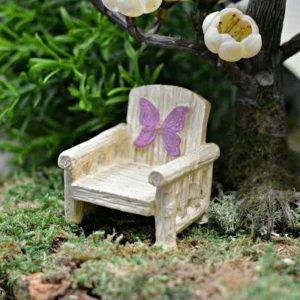 Some fairy garden products are created by a process of resin casting, whereby a mold is filled with a liquid synthetic resin, which then hardens. Metal, or a combination of metal and polystone is also commonly used in the manufacturing of fairy garden products. Metal is often used and preferred because of its durability. Some products are made from shaped metal, while others will feature wire in their design. Every product on our website will state the dimensions of the item as high, width, length. This uniform approach applies to all products, even though it may seem odd to measure a fairy figurine this way! D – Stakes for secure positioning feature on many of our products. The length of the stake is not factored into the overall dimensions. Products with a stake have this mentioned as an attribute within the product description. 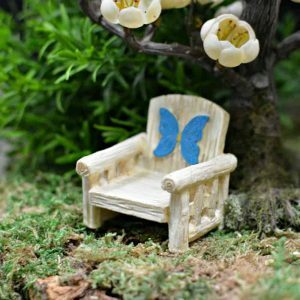 Fairy garden products are not categorized by scale. High Quality products are made from better performing materials. A painted product will feature more vibrant tones and the adhesives present within the paint will have a higher level of UV stabilization. High quality is also apparent within the design itself. Firstly, care has been taken by the designer and small intricate details will be present. The production process includes high levels of quality checking and control. These products are most likely to be manufactured by a company under their branding. Low Quality products are made with high quantity and low cost in mind. Inferior materials are often used. Paints have less vibrancy and definition. Designs are likely to have less detail and are often copied from original designs. The production process is faster and includes lower levels of quality checking and control. Branding is usually abscent. Pricing is a good indicator of quality, but not always. It is important to note that both ends of the quality sprectrum are important and serve different purposes. We understand that a number of factors will influence the choices of our customers, but above all, those choices should be educated. Fairy Gardening Australia chooses to stock high quality products from a number of manufacturers on our website. An online customer is unable to see or feel the product in real life prior to purchase, so we make this arbitrary statement to provide our customers with reasurance about what they can expect. However, we are also mindful that low quality/cost products have a valid position within the marketplace. For this reason, we do stock lesser quality items but they are only available within our showroom and will not appear in our online catalog. This gives our customers the opportunity to see/feel the product, compare it and decide if it is the best choice for their purposes. 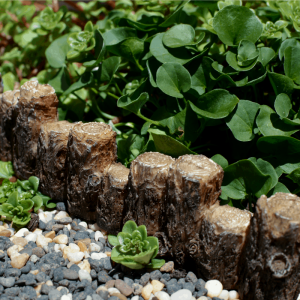 If high quality and durability are important to you, we recommend our Fiddlehead range of fairy garden products. This premium collection is made of polystone, features intricate design and detailing and high quality paint finish. We stand by this brand. Why? Because it is manufactured and imported by Fairy Gardening Australia. 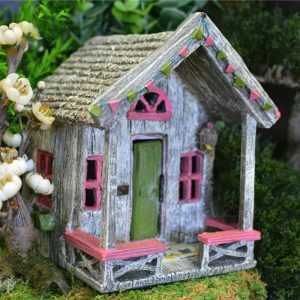 Fairy houses have a number of features including interior/exterior LED lights powered by a built in solar panel, opening doors with a hinge and fixed, non-opening doors. Within each of these designs you will find a variety of styles such as woodland, whimsical, classic and cottage. Overall size, design, attributes and features are listing within the product description on every house in our range. Fairy Doors are generally designed to be non-opening, however, there are occasional exceptions. Fairy doors feature a flat back and attachment to a wall/tree is facilitated by a keyhole slot. 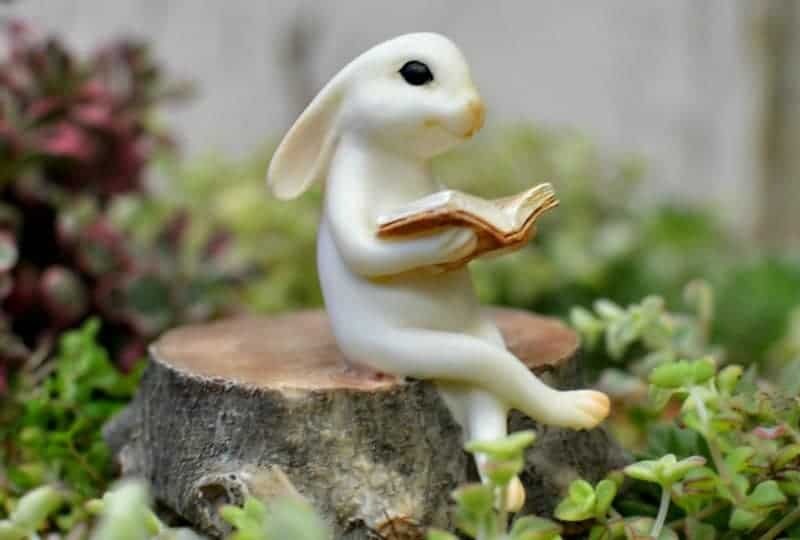 Fairy, Animal and Other Figurines vary by style. Some are designed to be bright and whimsical, while others have a “statue” appearance. Figurines in standing positions will usually feature a metal stake which assists the figurine to remain in an upright position. If a stake is present, it will be listed as an attribute within the product description, along with the measurements of the figurine. Ponds are generally divided into two types – fillable and non-fillable. Fillable ponds may be filled with water and are designed to be pressed down to appear level with the landscape of your garden. Non-fillable ponds are painted with the appearance of water or filled with clear resin. Some may be pressed into the landscape while others are designed to sit on top of the landscape. Each of these attributes can be found in the product description. Elements include furniture, hardscape, and accessories. Styles, dimensions and attributes for each product can be found in the decription of each product listing. Products that feature glowing parts have this listed as an attribute. The luminous effect is created by a phospherous material which absorbs light. It is important to note that this luminous effect is very soft and will not have the same lighting effect as an LED light. Glow effect will be dependant on the light absorption. 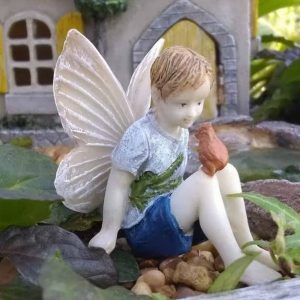 All our fairy garden ornaments are deisgned for outdoor use unless stated otherwise. Keep in mind that “outdoor” is a very general term! Our product care guide includes a section with information about choosing the right location for your fairy garden. I love everything and don’t know where to begin!